Neutral is SO the new classic. This kitchen was elevated to a whole new level when we painted the cabinets a creamier off white. We choose the island color by going two shades darker than the wall color. The color provided just enough contrast for interest while coordinating with the backsplash and walls. The client was not in love with the arch detailing on her doors. Therefore, we decided to forego the pinstripe glaze for fear it would emphasize the shape. Instead the clean cabinets flow perfectly with all of the client's molding throughout the main living area. This ordinary kitchen received a total makeover by the client making smart investments. She had the existing island shifted to create functioning seating. She also installed new appliances and hardwood flooring. Then she employed us to paint her golden cabinets in a soft cream. My favorite detail is the dark walnut stained butcher block top on the island. This kitchen has tons of personality with a wine rack, desk area and an island. I love it when clients take my advice and add character to builder grade cabinets with inexpensive trim. The result is charming. Especially when we glaze the trim to emphasize the uniqueness. We broke up the space by painting the island in a darkish gray with black glaze. This kitchen was just a little too traditional for this house in the heart of Raleigh. The dark cherry was nice but, it weighed down the space. Fresh off white cabinets modernized the kitchen and created flow within the other rooms on the main floor. This island had as many panels as some kitchens have in doors. We debated and tried several dark colors to contrast with the cabinets. It was finally decided that the island needed to blend with the cabinets - not compete. The result is a crisp kitchen that should be in a magazine. The "crowning" jewel to this transformation is the extra trim that our favorite contractor, Jim Ferrell added prior to our arrival.  This kitchen has undergone two phases of painting with Lexie and the Chi. We used a creamy off white on the fairly ornate cabinets. Then we used a greige on the custom built island which instantly warmed the entire space. I absolutely love this kitchen! One of my favorite parts of our business is to see people's homes and share advice on how to achieve their desired look. I get it. You live in the same house for years and while you know you want to make changes - you become accustomed to a look that doesn't really represent YOU. That's when you need an outside professional to give you ideas to you will love and ultimately will increase your homes value. Immediately in this house we discussed the red and gold wallpaper needed to vacate the premises. We also discussed how clean while cabinetry would POP against a sea-worthy aqua. Take a look at the gallery to see how those two changes made a world of difference!! This kitchen's owner has a style after my own heart - very eclectic and cheery. She wanted to put her house on the market and knew that a fresh white kitchen would help sell the house quickly. Buyers are really looking for bright and white kitchens! These cabinets also have medium tone gray pinstripe glaze for a POP of personality. This Master bath received a new look with a rich Espresso color. The goal was to remove the dated red tones of the original cabinetry. Espresso pairs well with lighter colors and creates an elegant contrast. The bright white and gray glaze makes for a fresh and clean look. Look how that backsplash and granite stand out against the crisp white. This kitchen and adjacent mudroom now have a crisp fresh linen finish that I absolutely love. The yellow tones in the previous finish dated and weighed the space down. The white finish makes the granite and flooring look brand new. This kitchen was painted in a creamy off white with a heavy brown glaze on the detailing of the door. We also made the suggestion that the client add a bit of beadboard to the plain peninsula back along with crown molding. These details make this space.